The Swansea Hockey Association is the world's largest outdoor hockey league. Normally that's a good thing if you ask me, but when it's -18°C, it's less of a good thing. The SHA plays at Rennie Park. 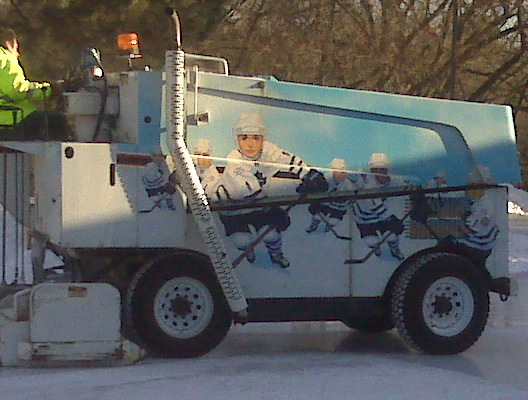 The Rennie Park zamboni has animated Maple Leafs painted on it, and it always brings a smile to my face. The turn out was amazing. They had to do a warm up inside between periods and shorten the game. My son will never forget it. Looking forward to my other son's game down there later today. No better place to be on Hockey Day in Canada. Want to watch exciting hockey ... go watch minor hockey. I just got back from my son's game. It's actually warmed up quite a bit and the sun is shining. You're right, it's the perfect plan to be on Hockey Day in Canada. I remember some games in -40 weather in Winnipeg as a kid. You were practically begging the coach to put you on so that you could warm up by skating around as much as you could. Mike - it's a true hidden gem in this city. I remember my dad teaching me to skate there in the late '60's/early '70's - just wonderful memories, and I wished I still lived nearby, so I could teach my kids to skate on the same rink.